Synopsis: A biologist signs up for a dangerous, secret expedition where the laws of nature don’t apply. Before making his directorial debut with the subtle sci-fi masterpiece Ex Machina, filmmaker Alex Garland paid his dues writing other, less subtle message movies like 28 Days Later…, Sunshine, and Dredd. 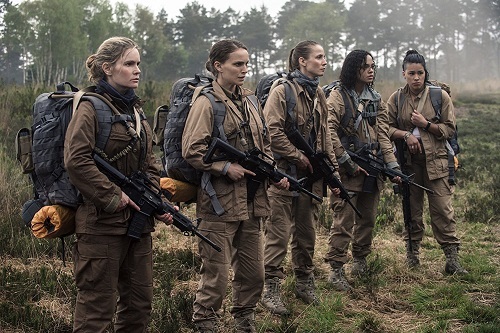 It’s taken a few years, but Annihilation, Garland’s sophomore film as a director, is here. Annihilation is about a biologist named Lena (Jackie‘s Natalie Portman) whose Army husband, Kane (Oscar Isaac from Inside Llewyn Davis), goes missing and is presumed dead while investigating the site of a meteorite impact. Because she herself has military experience, Lena is coerced into joining a team of women, led by psychologist Dr. Ventress (The Hateful Eight‘s Jennifer Jason Leigh), that is tasked with entering the area to determine what has happened to the lost expedition. This is not just any old quarantined section of land, though; the impact site, known as Area X, is surrounded by a strange rainbow-colored field that the scientists have nicknamed “The Shimmer.” Once inside the Shimmer, Lena and the team discover a crazy world of genetic mutations in which millions of years of evolution collide into single species of plants and animals. As they get further into the Shimmer, they get closer to discovering the horrifying truth about Area X.
Alex Garland adapted his vision of Annihilation from a novel by Jeff VanderMeer. For all intents and purposes, it’s a good movie. For the first three-fourths, it’s a great movie. It jumps around between the expedition, Lena’s interrogation at the end, and flashbacks to her life before with Kane, but that’s really the only way to tell the story and let the narrative unfold in a way that is both suspenseful and dramatic. There’s a mystery to be solved, both for Lena herself and for the team as a whole, and the audience is given just enough information for them to help figure things out. Before this starts sounding like a negative review, let’s reiterate how great the setup of Annihilation is, and how much fun watching the slowly unravelling mystery holds. Natalie Portman and Jennifer Jason Leigh are both at the top of their game, although neither actress seems to be particularly challenged. 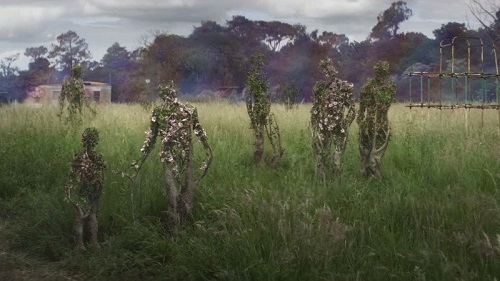 And Annihilation is still full of the philosophical horror that Garland’s fans loved in Ex Machina. It doesn’t quite stick the landing, but Annihilation is still worth seeing, and who knows? Maybe a repeat viewing or two will make sense of the long-winded final act. Annihilation looks fantastic. Production designer Mark Digby (Slumdog Millionaire) and his team make the Shimmer look like exactly what it’s supposed to be; a slightly warped version of the real world. At first glance, the area looks like a standard forest. Upon close inspection, the mutations in the lifeforms start to subtly appear – different species of flowers stemming from the same plant, or shark-like rows of teeth inside the jaws of an alligator. The deeper into the Shimmer that the women get, the weirder that the images become until finally, there’s a full-on H.R. Giger influence to the film’s look. And, just to juxtapose the fantastical with the normal, Digby makes the real world look almost sterile and flat compared to the area inside the impact zone. Digby’s work on Annihilation is almost subliminal, but it shouldn’t go unnoticed. Every detail of the film looks great. As is the case with Ex Machina, it’s the ideas behind Annihilation that are potentially frightening, not the movie itself. There are some great moments in the film, mostly involving animals and plants within the Shimmer, that would lend themselves to some great jump scares, but Garland elects to use them more as a tension building tool than a cheap release. Which is good – as long as it was a conscious choice and not a failed attempt at horror. Seeing as how Garland is not technically a horror filmmaker, we can give him the benefit of the doubt and assume that he’s not going for pure terror. Whether scares are the goal or not, approaching Annihilation with the mindset that it is a horror movie will only result in disappointment, because there are few (if any) scares to be found in the film.